Powers: Captain Corbin is no longer confined to only three dimensions of space. No prison can contain her; no walls can keep her out. She has been observed using her powers to disorient Flash, calling on the energies of the 4th dimension to increase her strength, fly, and merge with the 2nd dimension to become flat. 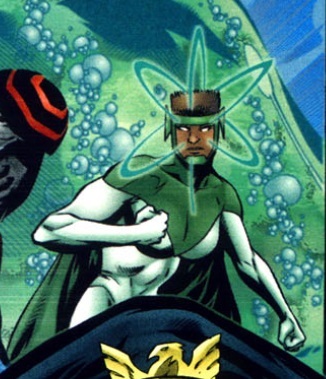 Captain Lea Corbin was a member of the United States Army who alongside Major Dan Stone, Lieutenant Colonel Scott Sawyer and Captain John Whether was chosen to penetrate an unknown dimension and as a result was saturated with radiation from the new element, proteum [JLA #24, 1997]. Each of the four gained superhuman abilities and under general Eiling formed the Ultra Marine Corps. After making their public debut to the press Eiling set up a battle with the JLA [JLA #24]. Her team managed to dispatch the JLA including Superman and Wonder woman. Lea was the first member of her team to suspect that something was wrong though she was talked out of rebelling by her teammates [JLA #25]. When Eiling’s treachery was discovered she joined with the JLA to take him down. In the aftermath of his defeat her teammates created Superbia, the city of tomorrow to continue to fight for truth and justice [JLA #26].